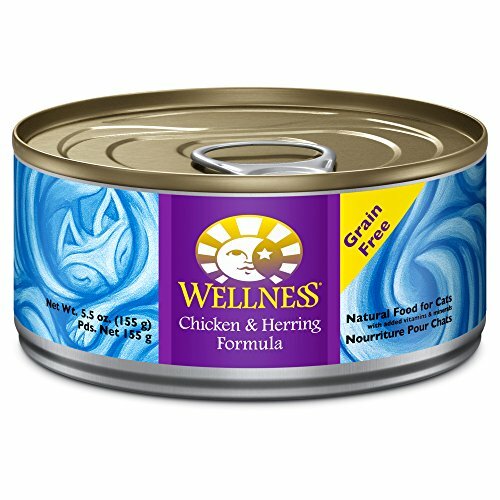 Wellness is a brand of cat food that believe in uncompromising nutrition for all pets that sustain their lives and protect their bodies. They use the finest ingredients that a cat needs and add in other high nutrition ingredients to supplement all areas of the cat’s body. But how do you know which of their products is right for your cat? When your cat gives you the look that says ‘you expect me to eat that?’ you just know there’s no way they will eat it. In fact, cats can be so stubborn about not eating something that doesn’t take their fancy that they will go on a hunger strike and can even give themselves health problems. Any cat owner will tell you that getting them to eat something new can be a real trial and sometimes you are doomed to failure. One trick to persuading your puss to try something different is to sneak it into their food bowl in small amounts with other food they enjoy. Once you know they have eaten it, gradually alter the balance in favour of the new food so they become used to it. The most important fact in picking what food to give your cats is that it is highly nutritional for cats. Feeding them dog food isn’t healthy and can even be fatal. Feeding them poor quality food filled with carbohydrates or bad quality protein won’t do them much good either. When picking a brand like Wellness cat food, you will see that the first item on the list of ingredients is what is called the named protein. This might be chicken, turkey, a type of fish or such and this is the most important part of the meal. To use this product as an example, the first ingredients on the list are chicken, chicken liver, whitefish, chicken broth and herring. The food also contains something called Taurine, which is an amino acid that is essential for a healthy cat and needs to come from their food. Other important ingredients for good all-round health include cranberries and blueberries, ground flaxseed and a range of vitamins. If you are starting your life as a cat owner with a kitten, then you should start their diet on kitten food. The best kitten food isn’t always the one they eat the most of because some manufacturers can be naughty and add ingredients that entice them to eat the food but are of no benefit to them nutritionally. It is a bit like kids – they will eat the sweets but it doesn’t do them any good. It is often recommended to base the majority of their diet on wet food because cat aren’t very good at drinking the amount of water they need and kittens even less so. While dry food has its benefits particularly that it doesn’t spoil when left out if your cat isn’t a big eater, trying to get your kitten to eat a good amount of wet food can be a benefit to them. Wet food is also more similar to the texture of the food they would eat in the wild so can ring some instinctual bell in their heads for what they should be eating. 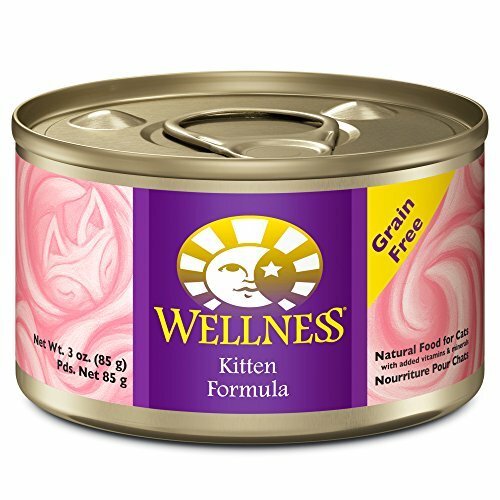 Wellness Canned Cat Food, Kitten Recipe,3-Ounce Cans,24 Pack. Wellness offer both wet and dry kitten ranges so you can balance between the two. This food’s main ingredients are chicken, chicken liver, chicken broth, carrots, sweet potatoes and squash. It too contains cranberries and blueberries as well as Taurine and other vitamins and minerals. Portion sizes are recommended that you feed a 3 oz. can over three or four feeding a day until they reach 20 weeks old then until the age of 30 weeks, around 2/3 can per pound of body weight each day. From 31-52 weeks, this increases to ½ per pound and then they should be ready for adult food. Of course, these are just guideline figures and you can always discuss your individual cat’s needs with your vet. Finally, whatever food you pick, make sure it has the AAFCO Cat Food standard on it guaranteeing quality of ingredients and nutritional benefits for your beloved pet.